An unreasonable amount of people are searching for Donald Trump’s daughter “Tiffany Trump” on Pornhub. Pornhub insights analysis shows the complete story. We all know that Donald Trump has become the 45th President of US and now Donald Trump’s daughter, Tiffany trump is the most searched person on Pornhub followed by his wife, Melania. This was not the first time we have seen the mega news that happens in real life lands on PornHub. During the launch of OverWatch, its character Tracer becomes the most searched term on Pornhub. Donald Trump’s election as the 45th president of US saw a surge in the Trump family’s popularity on popular adult website Pornhub. Soon after the results of the presidential election were announced on November 9. Pornhub registered a spike in searches for “Donald Trump” by 874%. According to Pornhub Insights, Pornhub users searched for Donald Trump’s current wife, Melania Trump the most. The world “Melania trump” saw a huge jump of 1,538% on the day following the election results. Donald Trump’s daughter Ivanka Trump, was also searched 1169% more over the previous period. 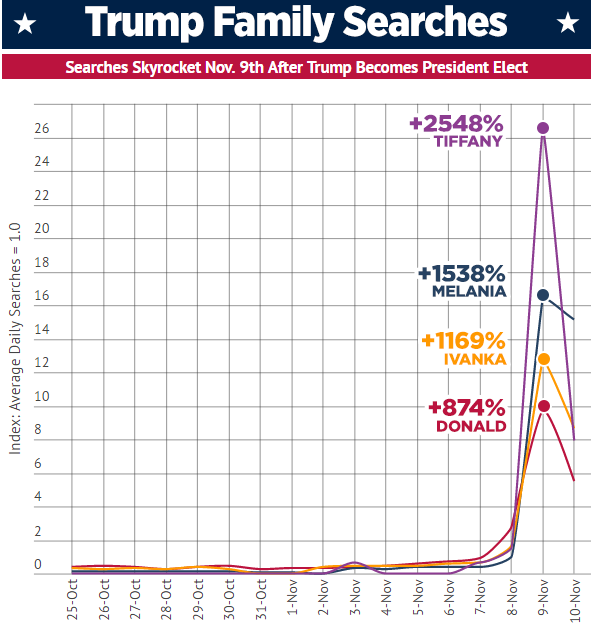 However, the most searched person from the Trump family is Tiffany Trump with a whopping 2548% rise in search in PornHub. Tiffany Trump is the only daughter of Marla Maples and Donald Trump and she is a celebrity. She is a singer, model and also has a music single called “Like a Bird” to her credit. However, on November 15, most Trump family members have returned to slightly above average but Tiffany Trump continued to increase. 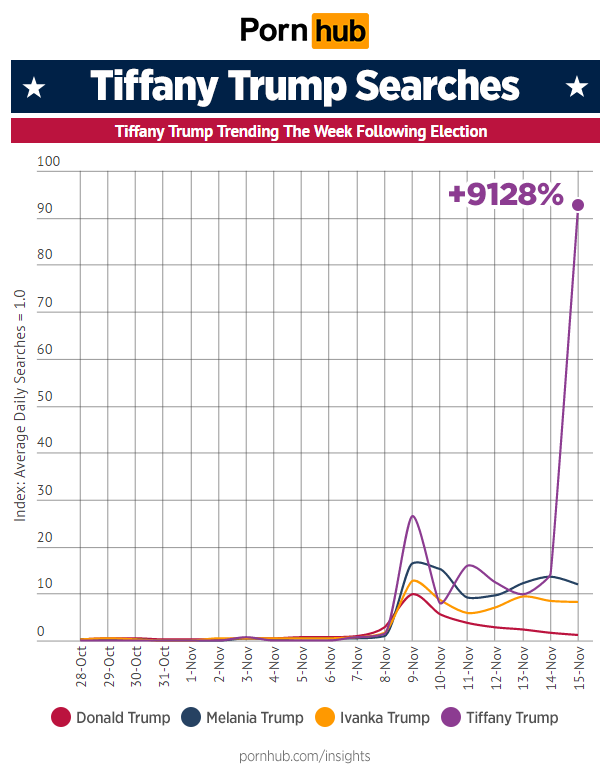 Tiffany Trump is now a trending search on Pornhub which has seen the uprise of +9128% based on her previous averages. So, what do you think about this,funny? Share your views in the comment box below.